The Royal Malaysian Air Force (RMAF) is based in Butterworth on the North West coast of Malaysia, on the mainland of Penang. Officially opened in October 1941, it was then named RAF Butterworth, serving as a Royal Air Force station. It served as a part of the British defence plan to defend the Malayan Peninsula against an imminent threat of invasion by the Imperial Japanese forces during World War II. Despite that, the RAF airfield was subsequently captured by units of the advancing 25th of the Imperial Japanese Army on 20 Dec 1941 and the control of the airbase remained in the hands of the Imperial Japanese Army until the end of hostilities in Sept 1945. Then, the RAF resumed control of the station where along with Royal Australian Air Force (RAAF) and Royal New Zealand Air Force (RNZAF) were stationed during the Malayan Emergency (1948 - 1960). 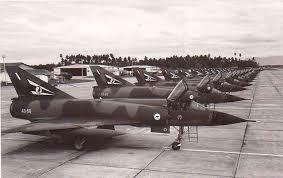 At that point, the station also served as a vital front-line airfield for various other units on rotation from Royal Air Force Changi, Royal Air Force Kuala Lumpur, Royal Air Force Kuantan, Royal Air Force Selatar and Royal Air Force Tengah. 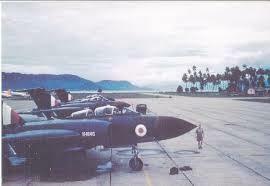 The base was also used by RAF aircrafts as a transit point to and from other RAF bases in the Far East region (including Singapore, North Borneo and Hong Kong), connecting them between RAF stations in the Indian Ocean, Middle East and Mediterranean regions. The RAF Station in Butterworth was closed in 1957. 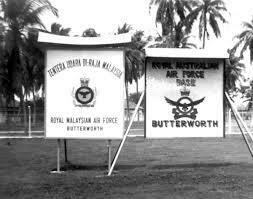 It was then transferred to be the base of RAAF and promptly renamed as RAAF Station Butterworth. From then on, it became home to numerous Australian fighters, and bomber squadrons who were stationed in Malaya during the Cold War era. There was a problem in the build up of the RAAF operational units in Malaya initially, with a shortage of people and units, and with the deployment of squadrons overseas and in Japan, Korea and Malta. These forces later returned to Australia at the end of 1954. Due to the change of circumstances, RAAF planners were encouraged to think more along the lines of a composite wing for Malaya, which was to include a headquarters, one bomber squadron, one fighter squadron, a base squadron for administrative and logistical support and a maintenance squadron. 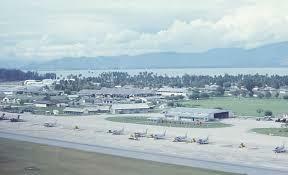 The base’s population of the operational units at Butterworth grew to about 1900 servicemen, both from RAAF and RMAF, and some 1400 Malayan civilians. For the RAAF, this signifies a productive and happy association with Malaya. With strong colonial legacy in the 1950s and 1960s, young RAAF officers and their wives had a fairly high standard of living. They could enjoy a first-class passage to Malaya on a cruise ship, indulge in cocktail meetings and dress formally for dinner functions. Penang was an exotic home to many air force families, and a number of them lived in tropical bungalows on the Island. The stylish mixture of Asian and British colonial architecture, a potpourri of races, the tropical vegetation and climate, delectable Asian food and a duty-free port filled with merchant shops from all parts of the world contributed in making Penang a well-enjoyed home to the officers. In addition, RAAF officers based in Malaya were awarded generous allowances which included up to three servants per household. Having adapted and making Penang their home, the RAAF officers and their families settled into a lifestyle based on work for the men and social activities at the tennis club, the Penang Swimming and Golf Clubs also the Runnymede and Eastern and Oriental Hotels. With increasing numbers of RAAF officers moving to the base in Penang, the need for provision of medical services, married quarters and schooling was evident. This was then put into place from mid 1950s onwards. In Oct 1958, the Department of Air established a permanent school at number 8 Residency Road in Penang Island, catering to the end of year eight. Teaching staff for the school were selected from the Department of Education of New South Wales and Victoria. Additionally, number 4 Residency Road was leased for an infants’ department. The number of enrolments rose to a total of 289 infants and 345 primary-age students. 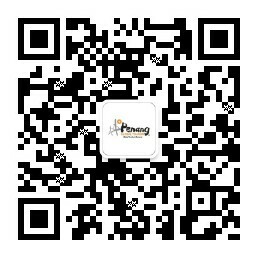 Eventually, number 10 Residency Road was also leased to house 102 secondary students. With enrolments consistently increasing at the Residency Road schools, causing inadequate and crowded conditions, a bigger school was needed. The RAAF School on Jalan Azyzeat Hillside Penang was completed on 30 Mar 1962 and officially declared open on 9 May 1962. When the school was built, there were three main buildings, an assembly hall and an attap hut for infants. In Sept 1965, a new attap was built for primary students. By 1977, student numbers increased to over a thousand. The school continued to expand as the number of students increased rapidly and reached a high of 1100 in 1977. The RAAF School completely closed in 1988 with the high school closing at the end of 1987 and the primary school in mid-1988. After its closure, students attended one of the international schools in Penang, namely Uplands, St. Christopher’s and Dalat. The RAAF School building remained, and is now used as the RMAF training facility and administration centre. The RAAF Club at 10 Tanjung Tokong in Penang came into place in January 1962 with its main purpose to cater to the social and sporting life of the families of RAAF officers during their stay in Malaysia. The centre originally operated as a hostel with a total of 72 rooms. During peak times, the club provided recreational, sporting and general meeting facilities for over 800 families. The RAAF Club, situated within easy access of RAAF families living in Penang, stood as a mini self-contained community and functioned as a meeting place for friends and a club that offered excellent facilities for enjoyment. The facilities of the club were specially catered to all RAAF members, Australian government public servants and their dependants, where recreational and sporting amenities were primarily for airmen. There were more to the RAAF Club, namely the Penang Health Centre, Penang Housing Section, the chaplains, RAAF police, transport office, post office, Supervisor RAAF Centre and the Public Health Section. These were facilities available for the benefit of members. The Department of Defence assumed full responsibility for provision of health care for all service personnel and their families, and the Penang Health Centre came as a convenience to the residents in Penang. Convenience store, barber and hairdresser, gift shop, library and a travel bureau were also within access to the members. The main focus of the RAAF Club was to provide social activities and entertainment to the officers and their families. Much effort was put in to ensure the club was a pleasant place to visit and to spend time. In the 1980s, the number of Defence Force personnel reduced and led to the closure of the RAAF Club. A new and smaller RAAF Club was later established for the use of families who lived permanently in Penang.